In student affairs there is a lot of messaging around being watched. From our first days of RA training to our interviews for mid and upper level positions we are constantly being told that “people are watching you.” We expect our staffs and ourselves to constantly be on, to always serve as role models, to never make a misstep. Or, if you do, don’t ever do it publicly. This is exhausting. I remember being a senior in college sitting in RA training and absolutely panicking during these speeches lectures. “Am I ready for this? What would happen if I stumbled? Would I lose my job that I really, really needed to help pay for school and that I really, really wanted because I saw myself as someone with something to offer students and my university?” #AMDG! Yesterday was our all college retreat. It was an invigorating day. When the president of the university makes time to come speak to you (we’re one of the smallest colleges on campus) that’s a big deal and speaks volumes about who and what she values. When the new Dean stands up and says, “We move forward together or we sink together” that’s a great gut check. I’ve gotten in my own way because I have been seeing myself and my career from inside the fishbowl, rather than outside it. I have let the messaging about executive presence and role modeling and blah blah turn into noise instead of what it is- good advice. Yesterday I arrived extra early so I had time to get settled, finish my coffee, and check-in to the event without rushing. (I am not a morning person.) Yesterday I wore a skirt and a jacket. I felt and looked great. Turns out, these were good decisions as the Dean saw me walk in and I got to spend a few minutes chatting with him. Now, I didn’t do these things to falsely create an interaction with the dean- it just happened. But, it happened because I was here and ready to go. It happened because I chose to put myself in a good light. That will only help me. 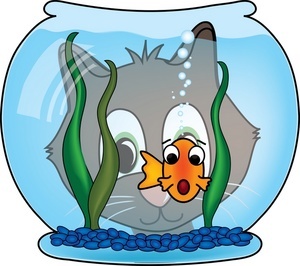 One of my many goals for the 2015-2016 year is to see myself and my career as outside the fishbowl. Instead of thinking of it as pressure, I am flipping the script and seeing it as opportunity. People are watching. Always. We make mental notes about each other. That sounds sneaky and sometimes it is (that’s another post). But, it’s true. People remember. I am going to work smarter to let them catch me doing something well. I am choosing to see the fishbowl as an opportunity to shine. We need to change the messaging about our roles in higher education. We need to encourage and teach our students, colleagues, and ourselves to see the fishbowl as a chance to show people what you’re capable of. I remember my brother said to me once that if you’re prepared, the test can be fun. The same can be true of work. Prepare (whatever that looks like for you). Then when the “test” comes, you’re ready. It shouldn’t be about fear. It’s a gift. Truthfully, most of us are more ready than we give ourselves credit for. Shine and swim on, friends!